This Thursday features the UNT Steel Drum Band playing Island/Calypso music. Thursday Twilight Tunes is a free concert series presented by the Denton Main Street Association and sponsors. The concerts are on the Denton County Courthouse-on-the-Square lawn, so bring a blanket or chair, grab a bite to go from one of the many downtown restaurants and relax for an evening of live music. Concert takes place rain or shine. In event of inclement weather, rain location is posted on this page the afternoon of the concert. Thank you to Weather Event Specialists for being the Featured Sponsor for this week's concert. Steel drum bands, a trademark of the Caribbean, are rapidly growing in popularity in the United States. These bands originated in Trinidad where groups participating in Carnival activities played on paint cans and oil barrels, which have tuned areas beaten into their surfaces. The various sets of drums, which are constructed by hand from 55-gallon oil drums, comprise a family of soprano, alto, tenor, and bass voices. Since their creation, steel drum construction has become a highly developed art form. Today, the "pan" is a legitimate, versatile instrument capable of expressing delicate passages in classical music as well as in traditional upbeat calypso marches and popular dance music. In 1982, UNT became one of the first universities to start a steel band program. 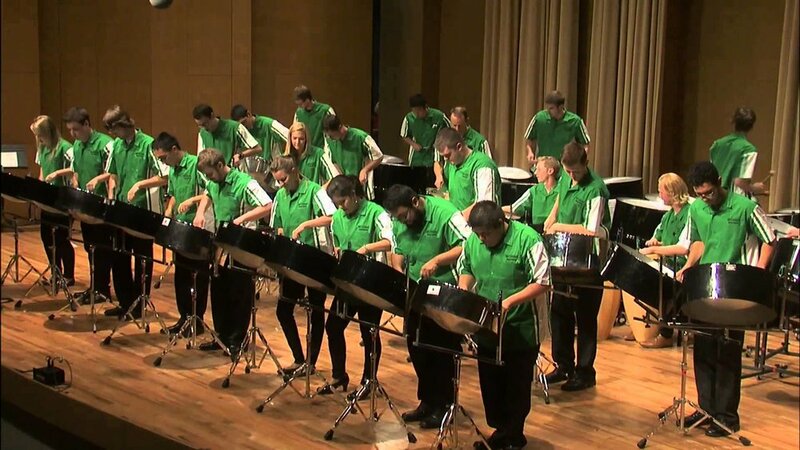 UNT students currently have the opportunity to perform in two steel bands.